If you're currently working at the kitchen table because you think you simply don’t have the space for a proper desk, think again! Building yourself a proper desk doesn’t have to cost you too much money or take too much of your time. Look for a good space in your abode where you can find peace and quiet and be able to concentrate. Build your own custom-sized table for cheap by buying local wood and hiring an apprentice carpenter to guide you on a weekend, or pick up a cheap second-hand table and make the necessary modifications. This sleek home office can be tucked neatly behind a screen of wall paneling in the living room. A simple DIY, all it takes is building a ledge into the narrow gap between two walls and integrating two pull out drawers underneath for storage. If you have a duplex, tuck a tiny second-hand bought computer table with storage under the staircase. Give it a fresh coat of paint, fix the wobbly cabinets, and it’ll be good as new! 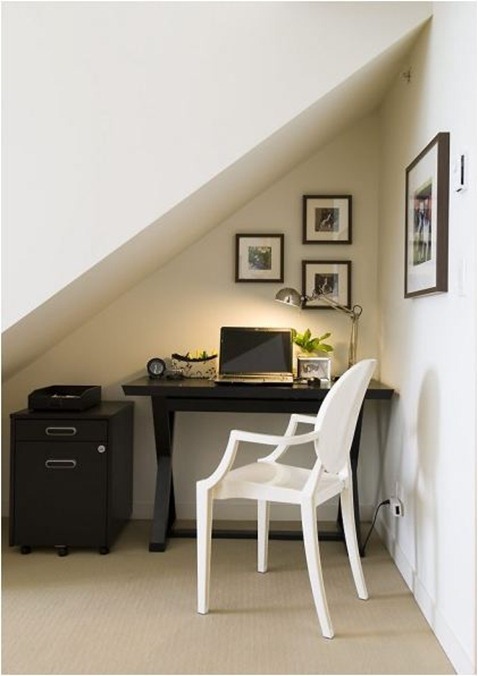 Or if both these ideas don’t apply to you, use up unusable corner space to create a smart yet comfortable home office area. Hate to hunt for a notepad to take down quick notes while you’re in the middle of ideation for a project? Convert a part of your desk into a whiteboard! A small whiteboard can be a big boon for your productivity since it is dry-erase friendly and so easy to use. It’s really simple too: buy a board in the corresponding size, and stick it on your work desk or a nearby wall. Cable organization can be a nightmare, especially in a small home office area. If the area behind your monitor is beginning to look like a jungle of wires that increases fire hazards, use these tricks to sort out those cables! Use twisted colour-coded wires or bread clips to label all the chords, and also try a DIY cable organizer using binder clips Yu could also build a cool wooden docking station plus cable organizer with a simple corrugated design using blocks of wood stuck together. You can also use readymade options for desktop cabling or DIY solutions like using clips etc. Are all those routers, power bricks, modems, extension cords and power cords creating a huge mess, plus demanding counter space in your already small home office area? Hang up them! Use a peg board organizer to simply pull everything off the floor or desk, and save space by building the organizer vertically. Place it behind your desk, under the table top, so it stays out of sight for a clean, uncluttered office space! Are you constantly staring down at your laptop or PC monitor? Not only is it bad ergonomics, it also puts further stress on your eyes. Instead of buying an expensive monitor stand, just build your own with a wooden shelf and some furniture legs or doorstops --- things you can easily find at the hardware store. Simpler options would be to get an ergonomic chair that lets you increase or reduce the height so the monitor is always at eye level. If you're looking to hire someone to help you with your workload and are struggling with ideas to upgrade your already-tight workspace for sharing it with another, this cool idea comes to rescue. Convert your storage bookrack and old work desk into a workspace for two by cutting the table into half and installing it as a ledge on either side of the bookrack to create two workstations. You can also hang labeled wicker baskets on the side for some extra storage. For more tips on transforming a workspace, check out this link here.